Yesterday I made my annual pilgrimage to the Minnesota State Fair Art Exhibit. Again this year it was a spectacular reminder of the great artistic talent in the State. There were 2,107 entries and just 325 works were chosen for the exhibition. In full disclosure, I also entered this years exhibition, but my modest painting was rejected. Although I was disappointed by the rejection, when I walked into the exhibit that disappointment was immediately replaced by excitement and appreciation. The work is wonderful and the judges did an excellent job in selecting the works for the show. Here are some of my very favorites. At the end of this writing, I'll post my favorite. Starting here with one of my most favorite artists, Joshua Cunningham. Titled, "West Seventh In Winter", this painting encompasses many of my childhood experiences growing up in this neighborhood which is the subject of his painting. It's masterfully painted and moody. Once again Cunningham shows us why he's one of the best painters in the state. "Jar Of Pimento-Stuffed Olives" by the artist Cynthia H. Waltho. Oil on Canvas. Whimsical and expertly executed in oil. 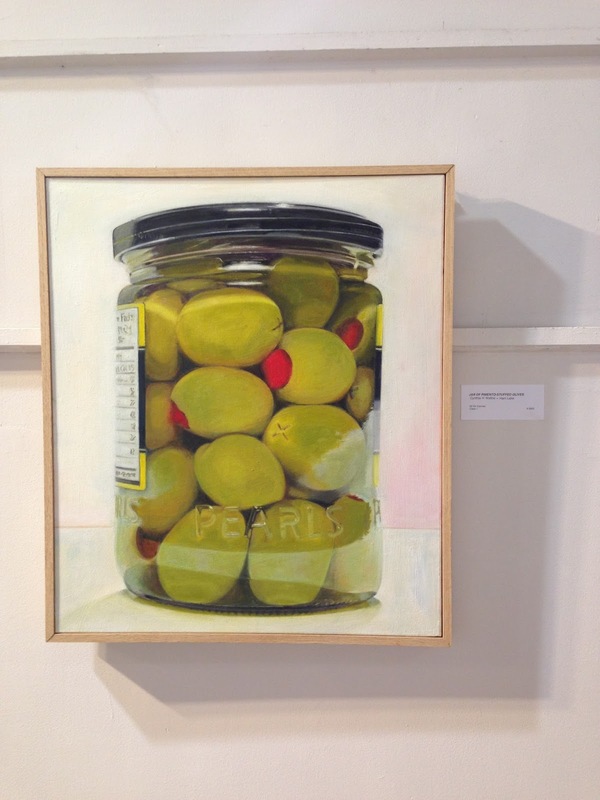 Waltho does a fantastic job on this painting and brings the plump, juicy olive and pimento's to life. "Cattails & The Old Cedar Ave Bridge" by Eric Doyle Cornett. This is my favorite drawing from the exhibit this year. Loughridge does a perfect job of capturing the scene and the painterly touch is amazing. 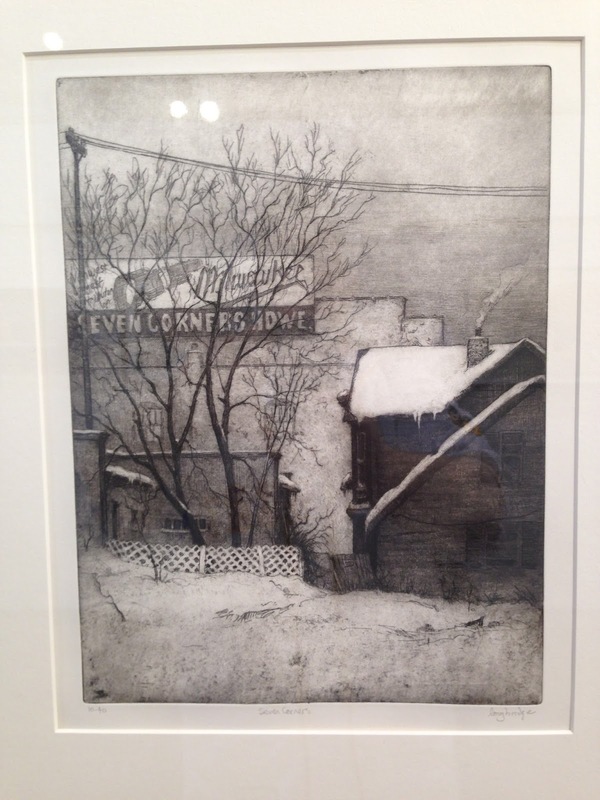 Scott Lloyd Anderson show once again why he is consistently recognized as one of the best among a great generation of Twin Cities painters. Green Space takes and ordinary view and makes it extraordinary. His work not just masterful, it's meaningful. Another favorite of mine is this spectacular painting by Carl Bretzke. It captures the winter perfectly and memorializes the pain that was the "Winter of 2014". And here is my favorite painting from this years State Fair. This painting titled, "The Conversation" by artist Linda Lee Nelson is expertly rendered and evokes a wonderful nostalgia. Nelson is a wonderful painter whose expertly crafted works are among the best examples of portraiture in the State. This painting is exceptional because it is simulteaneously detailed and loose. The key is that it is loose in all the right places. The light and shadow, hints of brushwork in just the right places. This isn't the first time I've seen her work at the Fair and it's always been excellent. Below is a link to more work by this exceptional artist.